Now I would like to show you that individual polypeptides can be accurately and rather easily viewed with the TEM without significant beam damage. 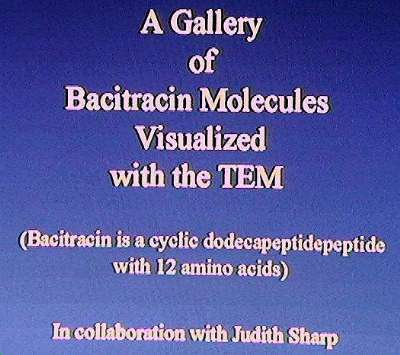 The example is a cyclic dodecapeptide, Bactracin. This cyclic peptide is a familiar antibiotic. Let's take a look at a gallery of various molecules in different orientations in the next slide.